Mathematics is causing headaches in schools across Canada, Australia and many other parts of the world. Mathematics is causing headaches in schools across Canada, Australia and many other parts of the world. Teachers in both Canada and Australia feel neither competent nor confident in math and, frankly, they are the first to admit it. As researchers, educators and authors who have advised globally about best practices for improving learning and achievement, we have had opportunities to notice common trends and obstacles, and notable gains, in math education. Up close, we’ve heard from teachers in Ontario, Canada, and in Australia and we’ve considered how people can best collaborate to protect and grow students’ love of learning. We’ve seen that some math improvement efforts get bogged down by fears of the unknown. Others get an initial spark but soon lose energy. 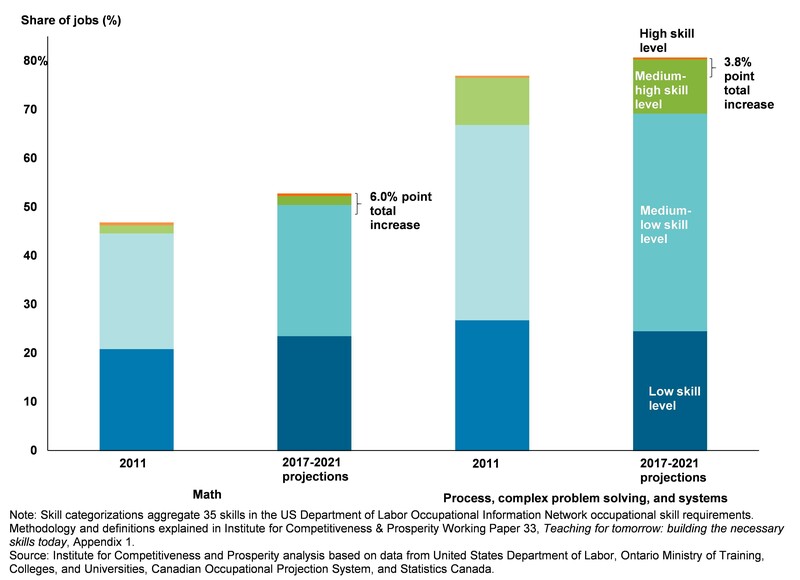 In response to a year-on-year decline in math scores, Ontario, for example, has started to give math achievement high priority. An underlying principle of the Ontario mathematics curriculum is to “investigate ideas and concepts through problem solving.” A September report from Canadian think tank The Institute for Competitiveness and Prosperity pointed out that inquiry-based approaches to mathematics actually get better results than more “basic” alternatives. But many parents and some educators remain skeptical, if not downright hostile, towards unfamiliar math strategies. In Australia, critics of inquiry-based mathematics curricula have suggested a change of course. In a recent story in the Sydney Morning Herald, with the headline “There is a better way of teaching bored Australian students,” a research fellow at Australian think tank the Centre for Independent Studies lamented that “explicit, direct instruction across the board is way more effective in achieving higher student outcomes.” One could not help but wonder how many parents might have been nodding their heads over their coffee. But while we can’t resolve the math problem simply by getting “back to basics,” we can revive good ideas about math education. From the early 2000s, Ontario’s government pledged to improve achievement in literacy and math (or numeracy, as it was then called). The government invested significant resources and established a Literacy and Numeracy Secretariat to spearhead the effort. Principals made literacy their top priority. Expert coaches worked alongside classroom teachers, demonstrating effective strategies and giving teachers feedback on how to use them with students. The gains in literacy were impressive and are now the envy of the world. But, like in a number of other countries, the literacy strategy consumed all the attention and left math with too little oxygen. It’s almost impossible to reform literacy and math all at once — the scope is too great, so the effort either leaves one of them to fall by the wayside by default or just burns teachers out. It’s time to give math reform the same treatment as literacy. But math reform has to confront an obstacle that literacy reform didn’t: Almost every primary and elementary teacher in many countries, including Canada and Australia, loves reading, writing and books, as do many of the kids. Literacy reform had a lot to build on. This is not the case with math. Compared to literacy, there is a shortage of teachers who feel competent in math and confident enough to teach students what mathematics is and what mathematicians do. Many schools also have shortages of colleagues with the expertise to help them. Some of the current answers to this problem — such as more hours allocated to how to teach math during elementary teacher training, or assigning professional development days to improving math teaching — won’t do any harm. But we must also address how confident and comfortable, and not just minimally competent, elementary teachers need to feel about math. In Ontario, for example, 80 per cent of elementary teachers have no university qualification in math. However, in Finland, one of the world’s leading performers in mathematics, around half of elementary teachers have studied math or science and how to teach them effectively during their university degrees. Second, in Singapore, the world’s No. 1 performer in math, elementary teachers are paid as much as engineers when they start teaching. This means students who are good at math choose teaching based on their mission and purpose in life, not on salary differentials. Perhaps Canada and Australia need to think harder about how to attract more people with math and science backgrounds into elementary teaching. Among top maths students, why does a gender pay gap exist? Third, improving teaching mathematics should be built on collaboration between experienced teachers and those with less confidence in schools. This coaching should focus not just on how to teach math but also on teachers’ relationship to math generally. Intensive coaching was a big factor in raising literacy achievement. Because math expertise is now thinner, teachers need more resources and resourcefulness in classrooms. Last, parents have a responsibility for their children’s math development too. But two-thirds of surveyed Ontario parents don’t know how to help their elementary-aged children with mathematics. Supporting school interventions known as family math that help parents converse about numbers and shapes with their children as easily as they might about words could do a lot to rectify this. We need to make math as much a priority now as literacy has been. We need to get teachers in primary or elementary schools just as comfortable as well as competent with math and how to teach it successfully to all children as they are with reading in their lives as well as in their classes. If we avoid falling for simplistic solutions, then eventually, the words “I am not a math person” may become a thing of the past.